Open311 provides open communication with public services and local government. Pledge support for the implementation of Open311 in your city or service. Help us develop Open311 apps and refine the spec to ensure wider interoperability. Open311 first began with an API for Washington D.C.’s 311 system, but it really become a community when the leadership of San Francisco and the support of organizations like OpenPlans, Code for America, and even the White House brought many cities, companies, and organizations together into a productive collaboration. Now it’s a rich ecosystem of cities, technology platforms, and forward thinking initiatives around the world that are building common infrastructure for people to better engage with their government and get connected to their community. Technical development and discussion around Open311 has continued on the mailing list, on GitHub, and in many other venues, but a lot of news about this burgeoning ecosystem has gone unnoticed. What follows is a long overdue collection of highlights that haven’t received enough attention. With the talk about Open311 as an open standard or as common infrastructure, it can be hard for the uninitiated to understand what Open311 really is, especially if they’re not familiar with a traditional government contact center or having a standard phone number. Is Open311 a product? Nope. Is it a piece of software? An app? A service? Sort of. As a technical standard, it’s a protocol that many of those things can implement to create interoperable systems. For those who aren’t software engineers, the good people at MySociety have fortunately created two really helpful guides to help everyone understand Open311. See Open311 Introduced and Open311 Explained. We’ve seen continued adoption of Open311 in the U.S. including statewide programs like Commonwealth Connect in Massachusetts and ongoing growth supported by companies like SeeClickFix and Connected Bits. There are also great stories of cities bootstrapping one another like the Open311 enabled open source CRM developed by the city of Bloomington, Indiana that’s been redeployed in Columbus, Indiana and Peoria, Illinois. Yet some of the most significant recent growth has been outside the U.S.. Toronto, the largest Canadian city, implemented Open311 not too long before Chicago became the largest U.S. city. Around the same time, there were a number of cities in Germany and the UK that also began to implement Open311 with the support of platforms like Mark-a-Spot and FixMyStreet, but broader adoption really came through the work of the City of Helsinki and the European CitySDK program. CitySDK was designed to establish standardized APIs for city services across Europe with a particular focus on three areas: Participation, Mobility, and Tourism. It was determined that the existing work around the Open311 standard could be used to achieve the mission of the Smart Participation domain and with the City of Helsinki leading as the flagship implementer, Open311 has been able to serve as a foundation for a major component of CitySDK. In addition to Helsinki, a number of other cities have begun to adopt Open311 through the CitySDK program including Lamia (Greece), Lisbon (Portugal), and Zaragoza (Spain). The full list of APIs in CitySDK cities can be queried through their Discovery Service. CitySDK was set up as a pilot (Pilot Type B) with 6.8 million Euro in funding (3.4 million from the European Commission) from January 2012 to June 2014 within the ICT Policy Support Programme of the Competitiveness and Framework Programme and similar work continues to build on CitySDK under the banner of new initiatives. This includes the 6Aika project to pilot and scale innovative solutions across the six largest cities in Finland and the Open and Agile Smart Cities program of the Connected Smart Cities Network which is building interoperable systems across Europe and beyond. The World Bank has also contributed to the adoption of Open311 around the world including a pilot in the Philippines and ongoing projects in Mozambique and Tanzania. Even the U.S. Federal Government has begun to experiment with Open311 by using it as an open feedback mechanism for requesting data and reporting problems with data – one of the mandates of the U.S. Government’s open data policy. An incomplete list of cities that implement Open311 is being managed on the Open311 Servers page. This page relies on everyone to help contribute and make sure their city is listed. People can make updates or additions by clicking the edit button at the top of the table and proposing the changes through GitHub. 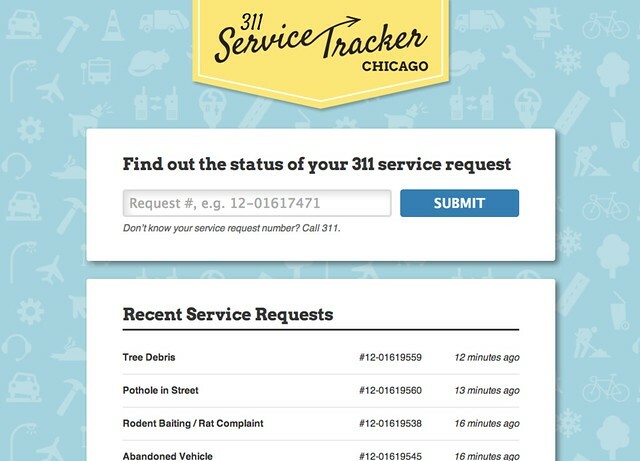 Currently the list is focused on cities that directly host Open311 through their own websites so it does not yet include the full list of Open311 cities available through services like SeeClickFix. As an open standard, Open311 creates interoperability between applications used for service requests and related citizen interactions. By building platforms around open standards, cities can really create open infrastructure much like the internet and prevent the kind of vendor lock-in inherent in many software systems. One of the most meaningful signs that the Open311 ecosystem has matured is that this concept has made its way into the procurement process. Starting with the City of Boston’s project to deploy Open311 across the State of Massachusetts with Commonwealth Connect, we’ve seen several other cities incorporate Open311 into their procurement language. This includes San Francisco, Chicago, and most recently New York City. As Open311 becomes more and more established there have been more opportunities to study it. Here are two notable findings using Open311 data to understand its impact and how it affects people’s relationship with government. A Harvard Business School study found that when citizens had more insight into problems being addressed, their attitudes towards government and government service delivery improved significantly. A study published in the Public Administration Review showed that lower-income residents as well as young, college-aged individuals were more likely to use the Open311-enabled smartphone app than the traditional phone number or website. Open311 has also made it’s way into many notable books in the past few years. Perhaps the first publication with wide circulation that mentioned Open311 was the Wired Magazine piece by Steven Johnson, but Johnson later wrote a book called Future Perfect that covered Open311 as well. Former San Francisco Mayor Gavin Newsom discusses Open311 in his book Citizenville as does Anthony Townsend in his book Smart Cities. More recently, Open311 was included in The Responsive City by Susan Crawford and Stephen Goldsmith. Hopefully this long overdue update provides a better view of the larger Open311 ecosystem, but we’re not done yet. Work continues to improve the Open311 standard and scale this ecosystem further. To get involved, please chime in on the mailing list. The Smart Chicago Collaborative helped write the application for Chicago to become a Code for America city focused on complying with the Open311 standard, and we have funded this project from the start. John Tolva, Chicago CTO and Smart Chicago Advisory Committee member, has been deeply supportive of the project and has shepherded it through to completion. Chicago Chief Data Officer and Commissioner of the Department of Innovation and Technology (DoIT) Brett Goldstein, along with Director Danielle DuMerer, has been instrumental in getting this project done, as were others at DoIT and people at Motorola Solutions and Connected Bits. Audrey Mathis, Director of 311 Services, has been great to work with as well. 311Labs: A space where your dreams of the possiblities of 311 data can become a reality! The Chicago Code for America fellows— Jesse Bounds, Angel Kittiyachavalit, Ben Sheldon, and Rob Brackett deserve a ton of credit for drilling down into a set of tools that make sense for the particularities of Chicago while being broadly useful as reusable code for other municipalities. They moved the 311 movement forward in ways that will be felt for years to come. They are technically top-notch, excellent communicators, and real-deal project managers, all of them. They listened to our needs and were able understand the unique technology setup that lied beneath a simple desire to see the current status of a pending service request. The technology upgrade will make the process of calling 311 to get a pothole filled, a tree trimmed or a broken streetlight replaced like using FedEx to send a package, under the plan, first disclosed by the Chicago Sun-Times last spring. In May I had the wonderful opportunity to present Open311 at the annual conference for the Association of Government Contact Center Professionals. This group can be thought of almost like a government equivalent of an industry association for contact centers. While the majority of those who attended were involved with 311 call centers, the AGCCP as a whole includes those involved with 911 emergency services as well as 211 human services hotlines, but it’s not even limited to call centers. There’s clearly an increasing focus on newer and more diverse channels to connect people with government. The membership makeup is primarily focused on the city level, but the association is also open to those involved with state and federal contact centers. I think this kind of broad inclusion represents a great opportunity to facilitate cross-pollination and collaboration between contact centers and different solutions much like we’ve started to see with the emerging ecosystem around Open311. This event was also a very useful opportunity for me to start shaping a presentation of Open311 to an audience that already has an intimate familiarity with 311-like services, but has less familiarity with technology. In all honesty, this is exactly the audience that Open311 needs to engage with, but is largely the opposite of the audiences I’ve presented to in the past where there tends to be a common understanding of technology, but less of an understanding of the dynamics and challenges of facilitating interactions with government. Over the years my Open311 presentations have gradually evolved as the the effort and the community has progressed and while this presentation builds on an existing slide deck, I made significant efforts to break down concepts and take a less technical approach. In general, the presentation was well received by the folks at the AGCCP and throughout the conference I was surprised to learn how many cities were actively aware of Open311 and were making significant strides to work with it. That said, I know a lot more is needed to help convey the concepts and the value proposition behind Open311 in a way that doesn’t assume an understanding of technology or even an understanding of government contact centers. I would love to ultimately develop a compelling story to tell mayors in the towns and cities around the world that have never had a government contact center. We need a presentation of the concepts, potential, and real world examples of Open311 that can give civic leaders a rich understanding of what this means both in terms of service delivery and civic engagement. We need a message that will inspire them to leverage this community and its emerging technologies and even leapfrog many of the costs and challenges associated with traditional contact center operations. There was a video recording of my presentation at the AGCCP which should be made available within the next few weeks and I will update this post when that is ready. In the meantime, I leave you with the slide deck that was used and welcome any thoughts and feedback on how to convey the value and potential of Open311 to civic leaders of all backgrounds. The following post was written by Andrew Nicklin of NYC DoITT, a long time member of the Open311 community. It’s a cross-post from the original at technickle.nicklin.info. The points Andrew raise about the challenges of scaling Open311 as an open platform are spot on and the whole post seemed important enough to re-post here. Andrew also thought it’d be best to get feedback about these issues here on the main Open311 website. So with that goal in mind, here are a few issues that I think need to be tackled in order to have a sustainable future. API Keys. At present, 8 of the Open311 endpoints (Baltimore, Bloomington, Boston, Brookline, Grand Rapids, San Francisco, Toronto, Washington DC) have distinct API key request mechanisms and key management solutions. The rest of the endpoints leverage a common SeeClickFix solution. (SeeClickFix also offers a proprietary API). As more endpoints are added, having to manage an array of endpoint keys is going to become untenable for the developer community. Authentication/Authorization. Although there isn’t yet clear consensus from the members of the Open311 community about how authentication/authorization fits in to the drafted specifications, one thing that is clear is that having to manage a customer identity at each endpoint will not make it easy for a customer to request services. Terms of Service. Along with requiring the independent provisioning of API keys and customer identities, each endpoint also has different terms of service which a developer must explicitly agree to, and a customer must implicitly agree to. Having to comply with multiple, differing terms of service is going to become untenable for the developer community. Geographic overlap. 311 as a telephone service is constrained to one call center/answering point per geographic region; this is imposed by the very one-to-one nature of a phone system. While following the same model has served the Open311 mission very well to-date, this isn’t the reality of how service providers work in the real world, and I think it will reduce the long-term sustainability of Open311 to stay with a one customer-to-one provider model. A customer can only be in one location when making a request, but they could be making a request to their local town/city, to their local county, their state/territory, their nation, or even to the world (e.g. the United Nations). Each of those tiers offers a distinct set of services, and in the ideal scenario, all of those services should be presented to a customer in a unified manner, regardless of who is offering them. At the moment, we all get around that problem by providing information which, technically speaking, is really the responsibility of others to maintain. For example, you can contact NYC 311 and ask how to obtain a driver’s license, and you’ll get an answer – but that’s a New York state-provided service, and they should own it.Incidentally, tackling this issue might eventually drive official 311 systems to leverage Open311 to make calls to other overlapping service provider systems. A final note on this: neither GeoWeb DNS, nor LoST (IETF RFC 5222) seem to support returning multiple services per query. The good news is that I believe there are solutions to all of these challenges. Before we start digging into those, however, I invite the community to comment on these and, more importantly, identify other challenges which I have missed or am unable to see from my perspective.